In BEN 10 ALIEN FORCE: Vilgax Attacks, players will take control of Ben and the popular alien forms: Echo Echo, Goop, Brainstorm, ChromaStone, Big Chill, Humungousaur, Spidermonkey, Swampfire, Jet Ray, and Cannonbolt to manipulate fire, harness electricity, freeze enemies and more. Players will also adventure as alien form Upchuck exclusively in the Nintendo DS version for additional powers to command and explore. Gamers will journey to exciting alien home planets on Ben?s first intergalactic adventure as they travel in an upgradeable spacecraft and blast through asteroid fields and enemy ships. 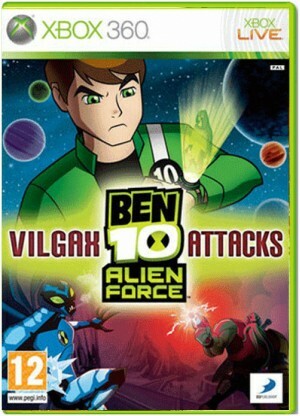 Offering a solid blend of combat, puzzle solving and platform gameplay, BEN 10 ALIEN FORCE: Vilgax Attacks provides hours of gameplay for players of all skill levels.